Fan art from stranger things! Lucas : I'm going to shoot something! Well done! I like this show! 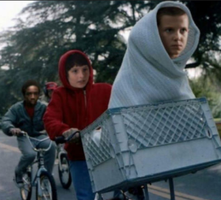 Haha, aww, this has to be one of the cutest renditions of the Stranger Things kids I've ever seen. ^^ All the characters look spot-on, you've really captured their personalities through their poses and expressions. Your lineless coloring style is really lovely; the effect reminds me a little bit of cut paper illustrations. It gives the whole picture a traditional feel even though it was drawn digitally. And this is a small thing, but I LOVE how you can see the colors of the Christmas lights reflected on the tops of the characters' heads! He does but there kind of pushed up into his skull because he has cleidocranial dysplasia. He also doesn't have collar bones.